Oregon ultramarathoner Katie Reim creates these detailed yet dreamlike portraits of grand American peaks. 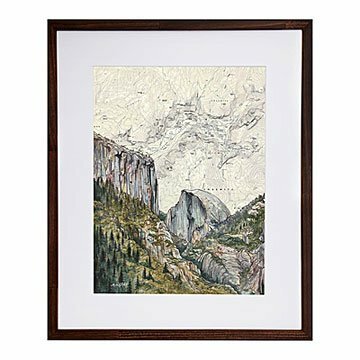 If mountains make your heart beat faster even when you're not hiking them, Katie Reim's detailed yet dreamlike portraits of some of America's grandest peaks will set it a-flutter. Katie, a talented illustrator and devout mountain lover, was inspired by the topographical maps she uses to navigate her long, ultramarathon runs through the hills. "Their contours are like fingerprints of nature," she says. She lets the maps' unique patterns guide each piece's composition, altering their colors to fit the mood of the place. Then, with pen and ink, she creates the intricate details. (Note: These are high quality prints of her originals.) The result is an artwork with vibrant layers of meaning that speak not only to the eyes, but to the heart. Made in Portland, Oregon. I purchased the unframed Smoky Mountains design and it's beautiful -- as pictured with vibrant colors and the matte is nice and thick. Would love to collect more!